8 foot deep (320 x 238 cm) it just seems so much more full of light than normal greenhouses. The potting benches are included, and all that glass is the 4mm ‘Toughened’ stuff. The mat’s not included ( Oh O.K. we’ll throw one in ) but you’ll really want to wipe your feet every time you go in to this lovely, lovely building. Like it’s bigger sister, the staging is included, and all the glass is 4mm toughened. The special environmentally friendly treatment of the wood means that it will never need treating again, although you could of course paint it if you like. As with all of our sheds, workshops, summer houses and those really, really tempting garden rooms ( would love to get one just for Joe, sure he would be so comfy, cosy living there ) ours are not the cheapest, just the best value. 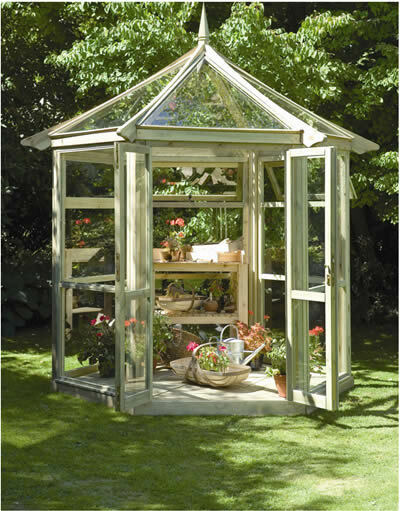 Look at this beautiful greenhouse, I want one, I so want one ! It just is so much more than just a glass house. 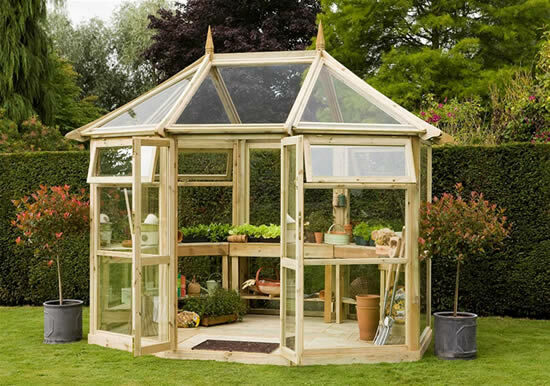 Of course he ( who shortly will be living in the spare room ) says we can’t afford it, and we already have a greenhouse. Can’t he see how lovely it is !! This is our slightly smaller greenhouse, well again it’s a glasshouse really, but I think ‘Greenhouse’ sounds so much nicer. Both our greenhouses are called ‘Pavilions’, a word that just reminds me of lovely, long summer days. Glistening wine glasses, the sound of willow on leather, gentle dozes while lulled by the susurrations of the trees and the birds. (Well, we do have room for two out of the three in our garden - and anyway who on earth would want 22 strong, sweaty young men all over the lawn.